Paper goods: a starter supply of paper goods (paper towels and toilet tissue) will be available upon your arrival. Typical amounts are 1 roll of paper towels and 1 roll of toilet tissue per bathroom. You will be responsible for your own firewood. Located on crystal clear Halfmoon pond in Searsport, Maine, this spacious lakehouse sits just off the water nestled in 5 acres of serene privacy. Halfmoon pond is a beautiful, private lake approximately one mile long and half a mile wide. Enjoy swimming and boating from the private float and large dock, as well as kayaking and fishing. Enjoy the finest of accommodations at the end of a private road with easy access to all the amenities and attractions Belfast and the Maine coast has to offer. Approximately a 45 minute drive from beautiful Acadia National Park and 35 minutes from Bangor International Airport. Complete with a full kitchen, laundry facilities, indoor and outdoor fireplaces, this private setting is of resort quality. Come stay and you won’t want to leave! Pets accepted, nonsmoking. Rental starting on Saturday at 4 pm to the following Saturday at 9 a.m. All arrangements are subject to change upon owner’s discretion. 25% Deposit required, refundable given 14 days’ notice of cancellation, remainder to be paid 14 days prior to scheduled start of rental. Metered data plan. Overage will be charged accordingly. Bedroom #1-Queen bed, Bedroom #2-Full bed, Bedroom #3-twin bed. Air mattresses available. Indoor/Outdoor Stone Fireplaces Full Kitchen with Microwave, Gas Range and Oven, Coffee Maker, Refrigerator, and Dishwasher Granite Countertops Gas BBQ Grill Complete Set of Dishes, Utensils, and Cookware New 60” HDTV Nintendo Wii Wireless Internet Check in time is 4 p.m. on Saturday Check out time is 10 a.m. on Saturday High Speed Internet with WiFi Washer/Dryer All Linens and Towels are Provided Large Deck with Ample Outdoor Seating Outdoor Table and Chair Set for 12 Canoe Two Kayaks Large Dock with Sitting Area and Swimming Ladder Swimming Float Adjacent to ITS Snowmobile Trail Paper goods: a starter supply of paper goods (paper towels and toilet tissue) will be available upon your arrival. Typical amounts are 1 roll of paper towels and 1 roll of toilet tissue per bathroom. I was expecting the place to be brilliant because of the pictures, but honestly they don’t do it justice. 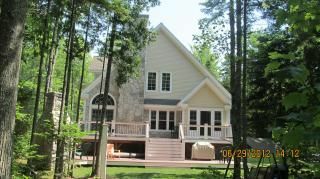 The house is warm and cosy but amply spacious, the dock is phenomenal and the lake is serene. It’s quiet and secluded and I would go back in a heartbeat. Me and my brother were there for a week, we had all the grand plans of visiting different places and we ended up not venturing further than the dock. I honestly couldn’t recommend the place enough, and when you couple that with an owner who was very welcoming and responsive and clearly just genuinely nice, I don’t think you could really ask for much more. Thanks so much for letting us stay! We so enjoyed our time on Half Moon Lake. The house is just beautiful (with a fully stocked kitchen) but what sets it apart is the outdoor space. From the outdoor fireplace and eating area up by the house, to the shady walk down to the dock, to the covered dock seating area where we lounged for hours, we couldn't get enough of the setting. Coffee in the morning, swimming and kayaking time during the day, watching for loons and the changing clouds, and evenings in front of the gas fireplace watching for stars. It was a great escape for us city dwellers and I'd recommend it highly for families. We also managed a day trip to Acadia and explored some of the coastal towns. A win-win of lake time and more traditional Maine sights, dining and shopping. Every year when I start planning our vacation I spend many hours looking for our perfect "home away from home". This year I definitely found it. My husband agreed. If you are looking for a beautiful home, that has everything you could possible need. This is it. We spent every morning, and evening just sitting out on the pier taking in the quiet and beautiful lake.... and the loons. It was my favorite place. It is even more beautiful than the pictures show. It is close enough to go off everyday and come back to sit everyday. We drove to to Greenville to look for moose. Took in Camden, and Belfast one day. Took in Acadia National park. These are all close enough for a day trip. The Thibodeaus meet us at the door the day we arrived, and were so nice to offer us anything we needed. You will not be disappointed in this beautiful home. We didn't want to leave. Thanks to the Thibodeaus for letting us live your dream for a week. It was nice meeting you as well. So glad you had a great visit to our piece of heaven. Fanastic!!!! Can't wait to go back. The house and location were perfect for our yearly anniversary get away! We decided to try Maine and were not disappointed. Everything was as advertised. Clean and warm and wonderful. Kitchen super stocked and we cooked dinner every night. Our Golden Retriever swam and loved running around property and investigating the woods. He passed out every night in front of the fire. I have already recommended the home to two friends who saw our vacation photos! We loved the house! It was a great gathering place for family and friends the week of our daughter's wedding in Belfast. While our wedding week was hectic, we knew we had a restful place to return every day. The kayaks and canoes and paddle boat were a great bonus! We enjoyed cooking in the spacious kitchen with the large island, and there was plenty of space in the great room for everyone to kick back and enjoy. Only suggestion: please add more hooks in the bathrooms and on bedroom doors for hanging towels. This was the perfect week away for our family. We fished, toured around, hiked in Bar Harbor, explored Belfast, ate lobster, played games, and enjoyed all of the amenities of the house and property. My in laws enjoyed reading and enjoying the view on the back deck, and my kids couldn't get enough of the bass fishing in the crystal clear water of Half Moon Pond. Yes, there is a Wii in the family room, but the kids didn't even touch it; they were too busy having real-life fun. Thanks, Mike and Stacy, for a wonderful week. Thanks so much Abbey and family. Glad you had a great time of making memories!